We all have one, right? That look that says it all. It might be a look of love, or a look of fear, or a look of satisfaction (smug or otherwise). The list is long. Well, this is my look when someone besides Betsy is sitting on my piano bench in front of my piano. That someone is Betsy’s adult student, Ronnie. For some reason she seems to prefer my piano when she comes for a lesson. The Briggs piano is a fine piano, but she always chooses my shiny, black Yamaha. Admittedly, she has good taste. I’ll give her that. So I sit staring at her for her entire lesson every week, waiting for that inevitable moment when she checks her watch, closes her sheet music (I don’t need sheet music, by the way), and then gets up, bows and pushes the bench in closer to accommodate my reach. It is a humble gesture on her part, as though she suddenly realizes her mistake and seeks to reaffirm that I am, indeed, the only true diva in the room. Being as much a lady as a queen, I take my throne without further recriminations. 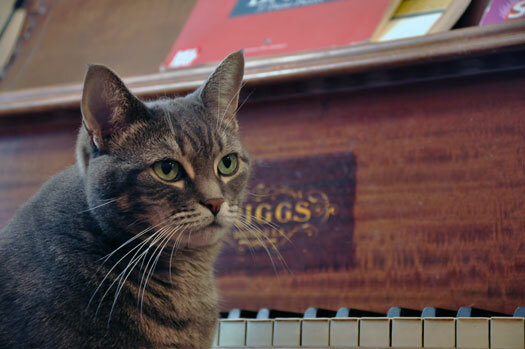 My look softens as I place my paws on the keys and stare lovingly at my reflection in the shiny, black finish of my piano. Nora you crack me up! That Yamaha usurper must have nerves of steel. Personally I would not be able to concentrate with you glaring at me like that!